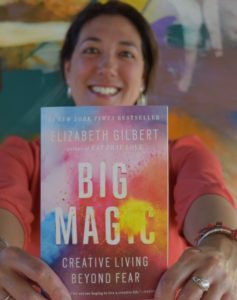 I recently read Elizabeth Gilbert’s book Big Magic and a few interesting things happened to me. First, many passages resonated with me and I kept coming back to the book. Next, I found myself sharing her message with other people. And then, I started creating. Since reading the book, I have tapped into my creativity in multiple ways. I have written blog posts, created comedy scripts, produced projects at work, painted my house, and it goes on. So I thought I would share her message with a few more people that I love in Student Affairs. I offered a workshop on “Creating Big Magic in Student Affairs” at our division-wide staff development day. Think of a time when you created or finished something…and thought, “That is gooooooooood.” It may have been an assignment you completed in school or a picture you drew. Maybe it was something you built or a food you cooked. Another way to describe Big Magic is that while you were doing something you felt it flow easily from you. Gilbert describes it like being on a conveyer belt in an airport. You are being propelled. The time passes quickly. Or you are in the zone. Some people think creativity is self-indulgent. For some of us it was shut down when we were children. But, if we don’t express our creativity, it can result in resentment, grief and heartbreak. Brene Brown’s research shows 85% of people remembered an event in school that was so shaming that it changed how they thought about themselves for the rest of their lives. Further, 50% of those shaming events were around creativity, i.e. told they can’t sing, you’re a bad artist, your writing is terrible. Acknowledge fear but don’t let it drive you. Gilbert says fear and creativity are like conjoined twins. This is why we cannot kill off, deny or avoid fear. Instead, we need to thank it for doing its job (which is to keep us alive). But then, we must recognize that creativity is not (99% of the time) going to kill us. We must make space for fear – Gilbert describes going on a road trip with creativity and fear. Both are invited on the trip, but fear is not allowed to drive. Our fear can manifest itself in excuses, guilt (mom guilt), procrastination, and perfectionism. And it can prevent us from taking the leap towards creativity. IT DOESN’T MATTER IF IT HAS BEEN DONE BEFORE. YOU DON’T NEED PERMISSION TO BE CREATIVE. IDEAS ARE LOOKING FOR HOSTS. That which we are seeking is seeking us. When we are relaxed enough to notice and receive clues, information, and connections, then ideas will come to us. When we let our defenses down and ease our anxiety, creativity will come to us. When we are open, we can receive the physical and emotional signals of inspiration (chills on your arm, hair standing up on your neck, feeling like you’re falling in love). When you’re about to have a big idea, there will be coincidences, signs, everything will remind you of the idea. You may wake up in the middle of the night thinking about it (like I did with my comedy script). Become partners with your idea. This may seem self explanatory, but when it comes to creativity, working hard is also about being creative even when you don’t feel inspired. Gilbert emphasizes that our inspiration doesn’t owe us anything. She doesn’t romanticizing quitting your day job and running off to open a night club or kayak shack. She says if we decide to take a leap of faith it should be for the ride not the landing, because we can never guarantee the landing. She also says every creative endeavor has the bits we don’t enjoy. So if you want to pursue something you must choose a pursuit that you enjoy so much that you’re willing to put up with the unpleasant parts. She asks, what do you want to do? What would you do even if you failed? What do you want to do because doing nothing is unacceptable? We must also be patient and compassionate with ourselves when we engage in creative work. People don’t stop being creative because of lack of discipline or willpower. They often stop because of disappointment or judgement. Getting back to work requires forgiving ourselves and having empathy for ourselves. Gilbert says, “Your life is short and rare and amazing and miraculous, and you want to do really interesting things and make really interesting things while you’re still here. That’s what we all want for ourselves.” She says, “You have hidden treasures in you – everyone does – and bringing those treasures to light takes work and faith and focus and courage and hours of devotion.” I strongly believe that statement. Many years ago I created a presentation on time management. The whole reason I created it was because my mom was diagnosed with kidney failure. I wanted to make the most of my time with my family from that day forward, and I then I wanted to share that message with everyone. Because life is precious. And we don’t have time to wait. SUFFERING IS NOT A PREREQUISITE. Elizabeth talks about the martyr vs. the trickster. There are many artists and writers who are martyrs. In academia there are many martyrs who feel we must suffer and labor, putting in miserably long hours to get published or tenured. Maybe some of us feel like martyrs in our jobs in Student Affairs. The trickster is the opposite of the martyr. Your creativity does not have to be revolutionary or serve a purpose. It doesn’t matter if it has been done before. You don’t need permission to be creative. Ideas are looking for hosts. Having a genius vs. being a genius. Suffering is not a prerequisite. What kind of maker are you? What’s worth doing even if you fail? What does curiosity want you to do?